This is just one of those things I enjoy posting because of how ridiculous it is that someone would pay $999 for a phone coming out in less than 10 days. Furthermore this individual did nothing to block the IMEI and identifying information of the device in the pictures so if s/he is an employee and selling this device, someone better make that $999 last for a while! Any takers? Didn’t think so. Do yourself a favor and order the T-Mobile G2X on April 15th and pay 1/4 of this asking price. Guarantee you the winning bidder doesn’t get their device until after the 15th. If you buy this, you deserve to be shot. 3D Gaming, as in graphics. Not pop out. What a sport! Free shipping!!!!! Really it’s 499 off contract? I was thinking about making a offer of around $200 – $300 for some fun. Maybe ill get it lol. You are asking this guy to offer a contract price…. People you have to remember this is buying it outright. It is overly expensive but by like $400. An average highend smartphone costs around 500 outright but thanks to carrier contracts they allow us half off. $500 per Core. Not bad its like 2 phones in one! lol at making the $999 last. yeah maybe if this went up for sale in january or late december someone stupid enough maybe would pay $6/700, but never $1000. And I would love to meet the dumb dumb that buys this…..
Scroll up to Snoopyalien24. He is three times the dumb dumb for buying 3 of these. where is the optimus 3d?!?!?!?!!? Some stupid Tmobile employee for sure!! Lol the price is now 799..
what is this moible processor???? Seeing as their sell history has a lot of phones from several carriers its more likely that they are a dealer for multiple carriers (or the phone came ‘straight off the truck’) rather than a T-Mobile Employee. No employee has even seen this phone yet unless they were letting people at corporate play with them. Must have some connects at a distributor or something. Maybe A tech or someone if they got them early to get familiar with them but definitely no way this is a store rep. I called the local T-Mobile to ask if they had display models yet. He told me they did not but that his manager is using one right now as his personal. He said if I go in Saturday I can see it as the manager will be working and can show it off. Not true. I had a chance to play with it yesterday. And some people won them in a raffle. Saw it a month ago and today. I saw it 2 months ago in Korea. One fell off the assembly line so I got to play with it for a few minutes. I have also personally played with one. Certain employees who were nominated based on performance were given the devices. after playing with a g2x i can assure you that it is snappy. I suppose that proves that there is no micro SD card packaged with it. “This helps you reserve a place in line.”… LOL Priceless. A $388 place holder. The sale ended. Alright WHO BOUGHT IT!? You can’t be too mad at the seller, if someone is willing to purchase the phone for that much, why not? In all honesty though, why wouldn’t you just go to your local Walmart and purchase one at full retail? I thought everybody knew by now that you can get the newest T Mobile phone from Walmart up to a week prior to its official release! Anyone know if WalMart sells mobiles out of contract (full retail)? If so, anyone know the confirmed WalMart retail by chance? Yes, they do. The reason being is, the phone will not show in their system as an upgrade with the discounted price and so the only option you have is to buy it out right. You have to be slick about as some employes will know not to sell the phone early. I got lucky with my HD2. I could see behind the clerk, there must’ve been 15 and this was close to a full week prior to its release. I recall reading about and decided to call several stores-all of which denied having the phone stock. My wife needed to go to purchase household things and I just took a chance by going down to that section of the store. I always get my phones from Wal-Mart early. vibrant gs4g hd2 all came from Walmart a week early. you just have to tell the associate you are buying out right any will sell. If I call and ask if they have it would the say they have it before release? Or would I have to go to the store and ask. It makes no sense to buy it right now as you’ll get it for $500 in couple of weeks. i’m assuming optimus 2x accessories,cases etc. will work with the g2x? assuming tmo hasn’t changed the physical design at all. i’m already shopping for accessories and don’t see anything tmobile branded yet. this one is going for $1200 on ebay. wow and it seems that someone already bought it. Gotta say this thread has been best entertainment all day! 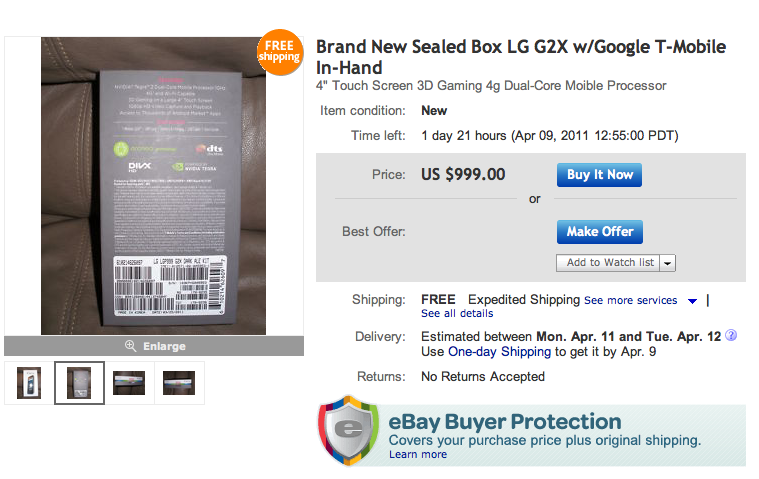 I found another T-mobile G2x for sale on eBay out of curiosity (apparently the other was either taken down or already bought)…. look at “Other item info”, and see history: it says 14 offers as of the time I am writing this comment. And the up-front cost is $1000. How stupid can people get? Often people will buy newly released phones (unlocked) at inflated prices when they are with other carriers, or out of the country. The asking price isn’t unusual under those circumstances. Pretty typical. I have the phone, and it’s benchmarks are awful…bugs galore….not a happy G2x user. But happier than the guy who bought his for $999!